Sponsored Editorial: Why are We Seeing an Increase in Peanut Allergies? Announcer: Welcome to Cracking the Code on Peanut Allergies on ReachMD. The following episode is brought to you through an independent educational grant from Aimmune Therapeutics. On this episode, Why are We Seeing an Increase in Peanut Allergies?, you will hear from Dr. David Stukus, Associate Professor of Pediatrics in the Division of Allergy and Immunology at Nationwide Children’s Hospital and The Ohio State College of Medicine. Dr. David Stukus: A question that I receive all the time is: Why are we seeing such an increase in peanut allergies? Many adults say they didn't know anybody with peanut allergies when they were younger. And we have seen dramatic rise in peanut allergies in the last few decades. Unfortunately, there are no clear-cut answers. To the best of our knowledge, it appears to be a multifactual interaction of somebody's genetic predisposition, allergic parents often have allergic children, and early life exposures that lead them to develop a peanut allergy. When somebody has a peanut allergy, their body forms an allergy antibody called IGE against peanut. Every time they eat peanut, regardless of what form whether it's peanuts or peanut butter, your body will produce an allergic reaction. Typical symptoms include: itching, hives that can progress very quickly for some people to cause vomiting, wheezing, difficulty breathing, what we call anaphylaxis, and in rare cases death. 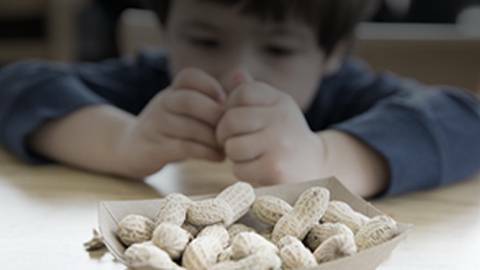 Living with a peanut allergy causes a significant burden for children and families alike. They need to be extra careful to make sure that their child does not eat anything containing peanut. This requires communication with school personnel and teachers, grandparents, caregivers. They need to talk to waiters and waitresses at restaurants, folks at bakeries and ice cream parlors. And in addition, they need to read labels on all packaged products to make sure their child does not accidentally ingest peanut as well. Because of the risk for potentially severe reactions, people with peanut allergies need to have their epinephrine auto injection with them at all times. As you can imagine, this can be somewhat of a burden to many families who try to remember to have this available and to follow these strict avoidance precautions at all times. And unfortunately, we know that roughly 30% of children with food allergies are bullied at some point because of their food allergy. Sometimes it's by classmates and other times it's by adults who don't have a clear understanding of what a food allergy entails - and there is no safe amount. Interestingly, our prior advice to avoid highly allergenic foods for infants until later in life, was probably wrong. That was based upon expert opinion and what we thought was best at the time. Now we have outstanding evidence that demonstrates the opposite. In fact, the earlier we introduce peanuts and other allergenic foods in the infants’ diet, prior to one year of age and then keep it in their diet, the better chance we have in preventing them from developing the food allergy in the first place. Announcer: The preceding program was brought to you through an independent educational grant from Aimmune Therapeutics. To access other episodes in this series, visit ReachMD.com/PeanutAllergies. This is ReachMD. Be Part of the Knowledge. Ever wonder why peanut allergies are on the rise? If so, you’re not alone. Here’s one expert’s answer to the question on everyone’s mind. With the prevalence of peanut allergies increasing, it’s easy to get caught up in the numbers and forget that living with a peanut allergy comes with a significant burden for children and families alike, as Dr. David Stukus from Nationwide Children’s Hospital and the Ohio State College of Medicine explains.